BLOOMSBURG – Canton had yet to play a game, but during an early-season practice Bob Rockwell heard some players canceling mid-June plans. The Warriors already would be booked by then, they said. Vacations could wait. Rockwell just shook his head. It was way too early to even think about playing in a state championship. Turns out, though, his players were right. The Warriors are headed where no other Canton team has ever gone. Chase Pepper threw 6 1/3 brilliant innings, Garrett Wesneski closed the game and Connor Route ripped three hits as Canton edged Old Forge, 2-1, Tuesday at Bloomsburg University and captured its first Class A Eastern Region championship. Next up is a trip to Penn State University to play in the state final. Canton plays Western Region champion Johnsonburg, an 8-1 winner over California, in Friday’s early game at Penn State’s Medlar Field at Lubrano Park. The Warriors (23-2) already captured the program’s first district championship and have set the program-record for wins. They are the second straight District 4 Class A team to reach the state final after Montgomery did so last year. Now the Warriors will try becoming the first District 4 team to win the Class A title since Southern Columbia in 2000.
Pepper threw 5 1/3 innings of no-hit baseball and outdueled Old Forge ace David Chromey. He let up his first run with one out in the seventh inning when Derek Drasba hit a one-out RBI single. Rockwell decided to bring in Wesneski, who threw a complete-game six-hitter against Calvary Christian in the state quarterfinals. As pressure-packed as the situation was, Wesneski was calm and collected. The 10-game winner induced a pop-out to shortstop Wes Moore before clinching the championship by striking out Brandon Wahl on three pitches. Rockwell, in his 26nd year raised his right arm in triumph as Wesneski pumped his fist. 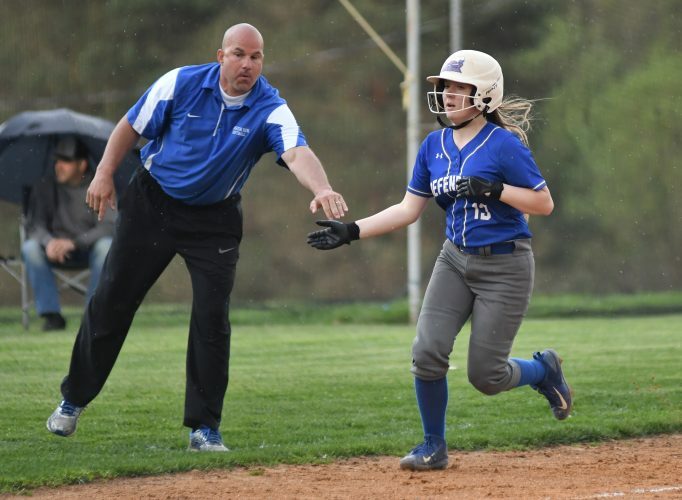 A team that survived eight innings against Muncy in the district semifinals and overcame a four-run deficit against Montgomery in the district final just to reach states for the first time has made the most of its initial opportunity. Wesneski has closed out two of those games for Pepper and embraced the role yesterday. Pepper earned his third postseason win and had thrown 11 1/3 consecutive scoreless innings in states before Drasba’s seventh-inning single. The junior right-hander had Old Forge (15-4) off-balance all day, faced only one batter over the minimum through six innings and picked off two runners. Pepper was so dominant that when Route hit a third-inning RBI double, one had the feeling that would be enough to win. When Route doubled again in the sixth inning and scored on Josiah Bardo’s perfectly executed suicide squeeze, Old Forge seemed in serious trouble. So did Route. The junior first baseman delivered his second three-hit state tournament performance. His clutch two-out RBI double put Canton up 1-0 in the third and his sixth-inning double ignited the second rally. Chromey held Canton to five hits, but Route had three of them and now has five state tournament RBIs. Route also was part of a strong defense that backed up Pepper and Wesneski and made repeated big plays. Second baseman Trevor Route made a tremendous leaping catch in the fourth inning while catcher Travis Butcher continued his strong play and helped stifle the running game while making two tough catches in a swirling wind. Still, if not for Connor Route’s big hits, that might not have been enough. Yesterday was Route’s offensive day. He is just one of many Canton has had all season. Since that Montgomery game, Canton has been making history with every win. 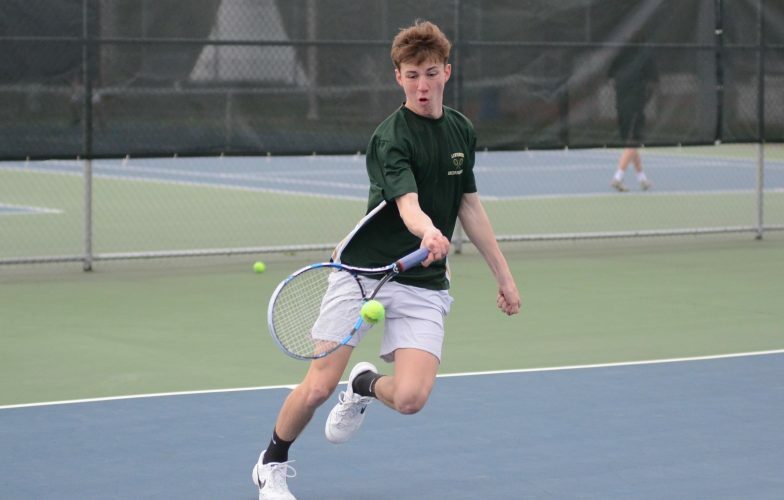 The past few seasons Canton had been like Sisyphus pushing the boulder up the hill only to watch it roll back down when it reached the district final. This is a new team and a new era. Canton is setting the standard at its school now. Now the ultimate destination awaits. Chase Pepper, Garrett Wesneski (7) and Travis Butcher. David Chromey and Steve Mascaro. Top Canton hitters: Emmett Watson, 1-4, run; Connor Route, 3-3, 2 doubles, RBI, run; Chase Pepper, 1-3. Top Old Forge hitters: Matt Mascaro, 1-3, run; Derek Drasba, 1-3, RBI; Paul Papi, 1-1. Pitchers’ lines: Canton, Chase Pepper (6 1/3 IP, 3 hits, 1 run, 1 ER, 2 BB, 6 K); Garrett Wesneski (2/3 IP, 0 hits, 0 runs, 0 ER, 0 BB, 1 K). Old Forge, David Chromey (7 IP, 5 hits, 2 runs, 0 ER, 1 BB, 8 K). With runners in scoring position: Canton 1-11; Old Forge 1-1. Runners left on base-in scoring position: Canton 6-5; Old Forge 2-0. Pitches-strikes: Canton, Chase Pepper 90-58; Garrett Wesneski 7-6. Old Forge, David Chromey 98-68. Batters faced-first pitch strikes: Canton, Chase Pepper 22-13; Garrett Wesneski 2-2. Old Forge, David Chromey 29-16.